Stuck on ideas for blog topics? Not anymore. In this article, I’ll go over the 3 strategies I use to make sure my blogs are never short of exciting content that readers love to read and share with their friends. Online forums are places where users go to get help from users. Most contain hundreds of thousands of threads and posts where users discuss just about anything on their mind. Whatever your business specialty is, there is a good chance there is an online forum where people talk with each other about the happenings in the industry. You can use forums to find ideas for your blog topics and tune into how people feel about the said topic. This is an excellent way to do market research and seeing what people are talking about today. For example, if you are an online marketing agency, inside the Warrior Forum you’ll find 1000’s of users talking about SEO, Pay-Per-Click, email marketing, conversion rate optimization and more. Finding a forum relevant to your industry is easy. Simply go to your favourite search engine and search your industry name followed by the world ‘forum’. For example, online marketing forum. 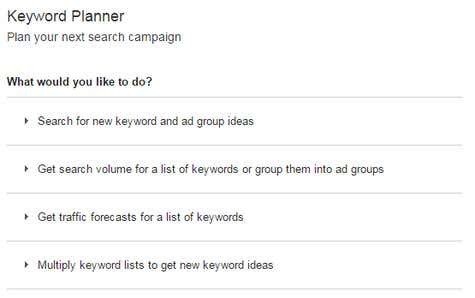 The Google Keyword Planner tool is designed to help businesses use Adwords more effectively. It is also an excellent means to discover what people are searching for. This allows you to shape your content by what you know people are already searching for as opposed to presuming your audience will appreciate the blog topics you were thinking of writing about. Best of all, this is a free tool anyone can use. You can find out more about the tool by clicking here. Noah Kagan, founder of AppSumo.com, uses a technique known as the Skyscraper Technique to find topics. The process essentially involves researching your competitor’s top blog posts, and then reproducing similar, but better, content. How can you provide better content? Incorporate images, videos, improve the writing, give the user more information. More information on this strategy can be found by clicking here. Finding topics for your blog doesn’t need to be a headache. All of these techniques can give you an endless stream of ideas and topics to write about. What techniques do you use to find ideas for blog topics? Let us know in the comments below. Discover what makes product descriptions sell and how you can create killer product descriptions yourself.